Update: Quake 3 Arena .NET Port is Done! Yup – I’m now done porting Quake III Arena to managed C++ with Visual Studio 2008/v9.0 and .NET v3.5. My apologies to the guys on my private email list for getting this post out a week late. I ran into massive problems getting the Release build to work, even though there was no difference between its configuration and the Debug build (the latter of which has been working perfectly for two weeks now). Turned out to be one of those, “…damn it! How could I have been so stupid? !” problems/solutions. The Release build doesn’t look in the same directory for DLL’s as the Debug build. As I explain in the post which started this effort three weeks ago, the QVM generation code was not ported (see the previous post for why). Therefore, mixing game DLL’s with QVM’s or running your own QVM’s will not work. The known issues in this port stem from old QVM code. So make sure you’re using all DLL’s in order to run this port. First thing’s first: you’ll need the retail copy of Quake III to run this source, it will not work with the demo version. I know what you’re thinking – “if I have the source, I can circumvent the license check, right?” Wrong. The license check isn’t the problem. The problem is that there are a few big differences between the structure of a demo PK3 data file and a retail PK3 data file. You’d have to change the code to read the demo format, which nobody has unless you work for Id Software. In order for the source to compile you’ll need the DirectX SDK. Quake III uses it for sound and keyboard / joystick / mouse input. You can download it here. I used the June 2007 release, but it should work with earlier or later versions. After the DirectX SDK installs, check for this environment variable: DXSDK_DIR. It should have been set automatically by the DirectX installation, but if it is not there, set it manually to the root directory in which the SDK was installed (on my computer it was: “C:\Program Files\DirectX SDK (June 2007)\”). The master solution file containing all these projects is under “<source root>\code\.” It is the only solution file in that directory. Open it with Visual Studio 2008 to get started. Hopefully there are no errors on loading; if there are, please contact me. Note: the “ui” project was originally part of Id Software’s source tree, but I removed it from the solution because it’s not needed (the project is still contained in the download, just not referenced). This project is used for the Quake III Team Arena (TA) game which is not part of this port. There are two important directories in the retail Quake III installation: the root and “baseq3” located directly underneath the root. The root folder contains “quake3.exe” and “baseq3” contains the three supporting DLL’s needed to run the game. 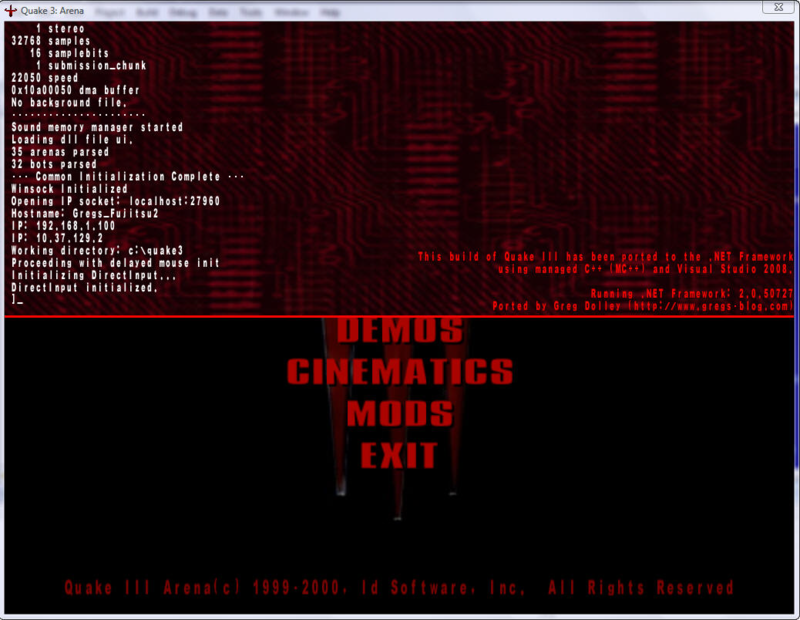 You won’t find these DLL’s in the commercial install of Quake III, but after compiling the source they will be put there (if you’re curious as to why this is, check out my earlier post about installing a Quake III mod). I would recommend installing another Quake III instance under the path “c:\quake3” if you don’t already have it there. That way, you won’t have to edit any of the project settings. And, more importantly, you won’t overwrite your commercial copy of Quake III after compiling the source. There’s nothing wrong with having two instances of the game installed on the same machine – you can have one as the original, and the other as a test-bed when messing with the source code. Change “<quake3 install dir>” with whatever directory you have the Quake III game installed. Now set the build configuration to Debug. Yes, you could do Release, but if anything goes wrong the Debug build will give you better diagnostic information. You may also notice other build configs in the drop-down list, such as “Debug Alpha,” “Debug TA,” and a few others – don’t touch these!! The only two you should be interested in are “Debug” and “Release.” The others are for Team Arena and non-Intel builds. They won’t work for this port. Now select “Build -> Rebuild Solution” from Visual Studio’s menu options. If everything builds with zero errors and zero warnings, great! If not, please contact me. Set quake3.vcproj as the startup project. It should already be set by default, but I’ve noticed Visual Studio 2008 seems to have a bug with this – sometimes, for no reason, the startup project will get changed. Sometimes on fast machines in single player mode, if you add a lot of additional bots after joining an arena, the game will have connection problems. The phone jack icon will display in the corner and you won’t be able to move your player. This bug also happens in the commercial version so it’s not a new bug. However, here’s a bug caused by the port which only happens in Release builds (Debug works fine). When connecting to some third-party servers on the internet, usually one supporting DLL fails to load (usually uix86.dll). When this happens, Quake III’s default behavior is to load the QVM files contained in the PK3 data files. As explained earlier, mixing QVM’s and DLL’s don’t work, so you’ll get very weird behavior if this scenario arises. If you take a look at the source code you’ll probably notice a lot of lines have comments that begin with this string: “***GREGS_VC9_PORT_MOD***.” A line beginning with this comment indicates that it was changed from the original codebase. It also contains a brief explanation on what was changed. This comment was added to almost every modified line except when getting rid of a keyword conflict caused by member variables being named “generic” (since “generic” is also a .NET keyword). This member was used on nearly 2,500 lines and I didn’t see the point in wasting time repeating the same comment over and over. Instead, one comment was added to the top of every module affected by this conflict along with what was done to resolve it. If you have any questions or problems with this port, please send me an email via my Contact page. The filter value set for GL_TEXTURE_MIN_FILTER is used whenever a surface is rendered with smaller dimensions than its corresponding texture bitmap (far away objects). Whereas the filter value for GL_TEXTURE_MAG_FILTER is used in the exact opposite case – a surface is bigger than the texture being applied (near objects). Not all of these combinations make sense to use. For example, there’s no point in applying GL_NEAREST with GL_LINEAR_MIPMAP_LINEAR because you’ll still see a sharp “break” between the trilinear filtered portion of a surface and the non-filtered portion. You should use whichever combination makes sense visually without compromising performance. What’s the Difference Between Bilinear and Trilinear Filtering? I’m not sure how many gamers, who aren’t 3D programmers, know what bilinear filtering means; however, I see it in the options of many games. It can be summarized by textures looking blurry up close and eliminating the “blocky pixel” effect which was so common back in the day of pure software-rendered 3D graphics engines. See one of my previous posts entitled, “How to Turn Off Bilinear Filtering in OpenGL” for a few screenshots. In this post I’ll be explaining what “trilinear filtering” means and how it differs from bilinear. We see an option for trilinear filtering in virtually every game on the market today (although some call it by a different name), and depending on your 3D hardware, it may even be turned on by default. However, most gamers don’t know what trilinear filtering really is (unless they’re graphics programmers) or how it affects the visual characteristics of a game. In a nutshell, just like bilinear filtering attempts to smooth out blocky pixels via interpolating between one texel and its surrounding four neighbors, trilinear filtering attempts to smooth out mipmapping gradients that are most commonly noticed when the camera is at a narrow angle relative to a wall (or any surface where the texture is very oblique to the point of view). Now, I’d really like to provide a screenshot of what this gradient looks like, but with the high resolution used in today’s games the effect becomes hard to see in a still screenshot. However, the effect is very noticeable when the camera is moving forward or backward. The effect manifests itself by a sharp break between blurriness levels as a polygon recedes into the distance. At first, the polygon’s texture looks normal (the part closest to the camera). 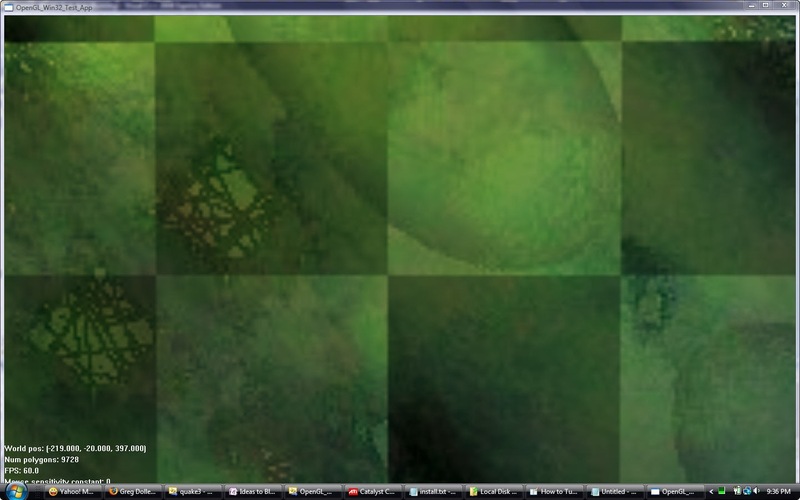 Then as you trace along the polygon’s surface all of sudden the texture loses half its resolution. If you continue tracing, you notice another break where again the resolution is cut in half. In most games this pattern is noticeable about four or five times before the polygon becomes too small to notice. Trilinear filtering attempts to eliminate this sharp break by dynamically interpolating between different mipmap resolutions at every pixel. For example, instead of choosing between a mipmap resolution 1:1 or 1:2, it dynamically calculates a smooth gradient of mipmap levels between 1:1 and 1:2. In the end trilinear filtering does a very good job eliminating abrupt changes in texture resolution. In some cases it is hard to tell mipmapping is even being used. Sometime later in the week or next week, I’m going to cover something known as anisotropic filtering – which is meant to be a step better than trilinear filtering. If you want to be updated on new posts automatically you can subscribe via RSS here, or if you prefer email updates click here. You downloaded a mod from a third party, followed the installation instructions, and nothing actually changed in the game. You programmed your own mod but couldn’t get it to actually run. OK, let me start off by saying if you are having trouble installing a Quake III mod, you’re not alone. I had massive problems with the first mod I tried. It was a very simple mod where I changed the rocket launcher’s trigger rate and rocket speed – so it could rapid fire like the plasma gun. 😉 And, in the end, I was only able to install it via the compiled DLL’s – the QVM files, even though they all compiled successfully, just refused to load. Since Quake III will behave the same way regardless of whether a mod is installed via DLL(s) or QVM(s) (although DLL’s are a bit faster), I didn’t see the point in continuing to beat my head against the wall over those QVM files. Therefore in this post I’m going to explain the installation of mod DLL’s only, not QVM’s. If you have successfully installed QVM’s on the v1.32 point-release, please contact me here or leave a comment on this post. This is the main problem: when you run Quake III using command line options, some parameters in the q3config.cfg file (under /baseq3) get overwritten in order to remember what was last set. Then, the next time you run the game, even if you don’t set the same arguments as in the last instance, the game will still run as if they had been set. For example, if you launch the game with, “quake3.exe +set vm_game 0” and later use just “quake3.exe,” those two instances will behave no differently. This can be very confusing and naturally results in methods never getting tested. As you probably already know, these three correspond to the three “mod’able” game DLL’s or QVM’s (qagamex86, cgamex86, and uix86 – if you’re running on a non-Intel platform, the suffix will be different than “x86”). There’s another big problem with installing mods and it has to do with the server’s operating mode. There are two modes the Quake 3 server can run under – “pure” and “non-pure.” A pure server can only run modified versions of qagamex86, while a non-pure server can run all three modules. Trouble is, even if you tell the game to use a module other than qagamex86, it will simply ignore your request if the server is in pure mode. You won’t even see an error message. Open a DOS command prompt. Press <Enter> and the game will load. Once you see the Quake 3 menu go ahead and start a new single player game. Press tilde (“~”) to drop down the Quake 3 console. If the console indicates your DLL(s) loaded correctly, then congratulations! Your mod should now be running in the game! That’s about it. If you have any questions about installing DLL mods, feel free to email me via my Contact page. I don’t know which video game popularized bilinear filtering (or trilinear filtering for that matter) for close-up objects but I personally hate the effect. The only time I can accept the look of filtering textures in this manner is if the texture’s resolution is massively high (so I don’t see the blur). Note: for this post when I say “bilinear filtering” I’m also referring to “trilinear filtering” – both have the same blurring effects. 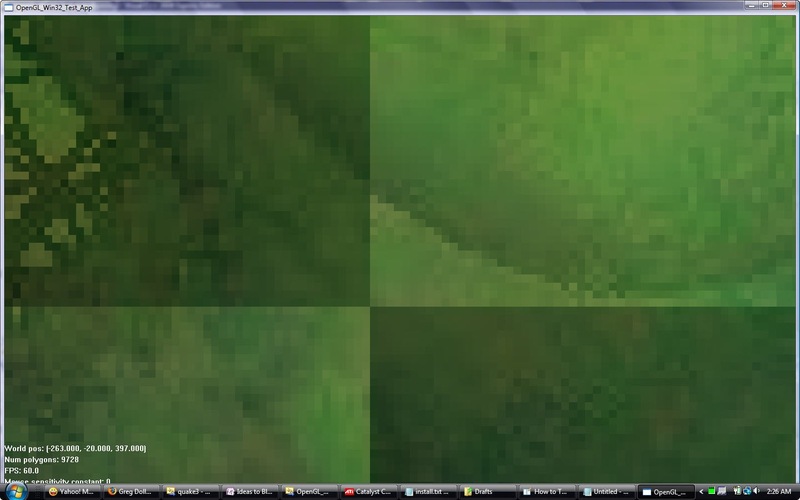 Hence the reason why I don’t like bilinear filtering. It just makes things too blurry. However, I have yet to see any game programming tutorial or OpenGL tutorial explain how to turn it off. I don’t want to stray off topic and explain each parameter combination, but don’t worry, I’ll write another post on that topic soon. For now, just know that most examples use GL_LINEAR_MIPMAP_NEAREST for min filter and GL_LINEAR for mag filter. This combination sets up typical bilinear filtering used in most games. Trilinear filtering is almost the same except GL_LINEAR_MIPMAP_LINEAR is used instead of GL_LINEAR_MIPMAP_NEAREST. When you set both parameters to GL_NEAREST it tells OpenGL to not interpolate any of the texel color values. It takes the calculated (u, v) coordinates, finds the texel nearest to that point in the source bitmap, and uses that color. So essentially it is just like old software rendering engines before everybody started using bilinear filtering. How to Fix – "C2039: ‘GetCurrentDirectoryA()’ : is Not a Member of ‘System::IO::Directory’"
Have you ever received either one of these annoying error messages from the MSVC++ 9.0 compiler? The reason for the error is that “GetCurrentDirectory” is also defined as a macro in windows.h. The macro expands to “GetCurrentDirectoryA” or “GetCurrentDirectoryW.” So in the example above, the compiler actually sees “Directory::GetCurrentDirectoryW” which obviously isn’t defined in the “Directory” class. Subscribe via RSS here. Want email updates instead? Click here.